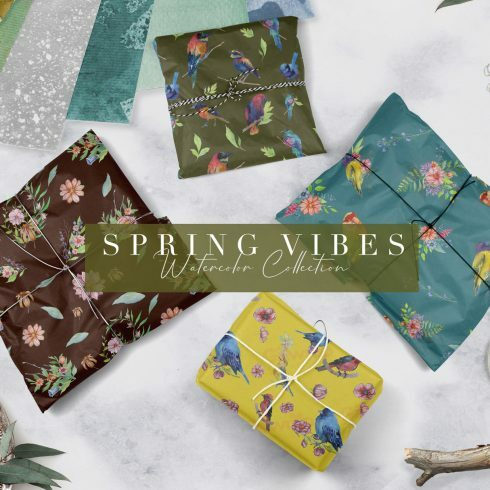 Spring Vibes – This set consists of hand-drawn floral elements and beautiful birds that you can easily add to your project. Generally speaking, textures are visual effects that replicate a single real-life material or finish. For example, there are a lot of folded paper and wood plank textures in a number of designs. Concrete, skin or rock ones are also in demand. Textures often consist of patterns yet they appear like they are natural and accidental. The effective use of texture vectors is not restricted to creating wallpapers, their characteristics can be employed in any layout element. By adding texture patterns, we can easily make an illusion of some natural traits, create levels, and make accents. A pattern can be recognized as canvas that includes recurrent pictures. Web design patterns are highly valued for being lightweight and responsive to various display sizes. It’s easy to come up with unique colorful backgrounds and point out individual objects with the help of patterns. 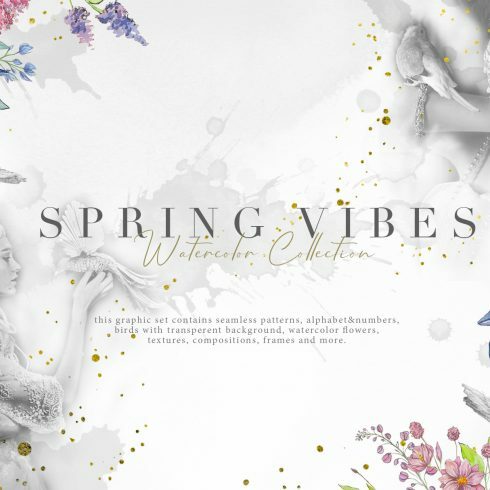 Numerous web developers select patterns over HQ images to create website backgrounds simply because they are very diverse, gorgeous, and easy to work with. Patterns easily compose vibrant and smart designs. Typically, we see patterns and textures in digital design, as well as website and product designs. You can implement these techniques to add value to any digital task or art piece. Incorporating a tasteful pattern or a sophisticated texture can absolutely change the overall look and feeling of any layout. The prices of patterns and textures vary from 4 to 50 dollars determined by their complexity and originality. We have the most diverse kits on Master Bundles. They are available in diverse prices, so everyone will discover a solution to suit their budget. The bundle is some kind of selection or set of design items. They are compiled to one single “package” and are advertised together, as one product. Often, there’s certain concept or purpose that integrates the design items within a bundle, but that is not really mandatory. The time, while the product bundle can be purchased, may be very small (around five days) and that’s the key reason why the price tag for it is below what those design items would cost you when marketed separately. Deals are quite cost-effective and allow developers to save quite a lot of dollars. What if the package deal does not carry all the items I need? Not every product bundle includes things you need and that is quite normal. They are created for varied purposes and for a different design and style. Nonetheless, MasterBundles.com website provides a wide selection of deals for each and every occasion, so in the case a specific product bundle doesn’t provide all the items you want – you can examine the other bundles. There are plenty of of them, that it is almost sure you will discover something suitable. What other packages does MasterBundles distribute? Each of the offers you find on the Masterbundles website are made by expert graphic designers and have gone through thorough quality control. The bundles include typefaces, graphic themes, WordPress templates, icons, PSD templates, mockups, social media themes. There are also stock pictures, illustrations, PowerPoint templates and CVs, photo overlays and indesign deals. There are offers with the price tag of less than 5 dollars and festive templates packs. MasterBundles.com is an online marketplace. On our resource, expert graphic designers promote their creations at the best prices. We provide you with the best deals on the market, and our products are well reviewed by buyers. Check out our blog, it is full of practical information for professional designers. Furthermore, in case you sign up for our newsletter, you’re going to be the first to be informed on our discounts. And we absolutely love discounts. There will always be coupon codes and promo codes offered to reduce the price to a bare minimum.